For once, eating with your hands (in Japan) is OK.
O-Nigiri (Japanese: おにぎり、お握り) is sushi that you grasp while eating it. Put simply, onigiri are rice balls with fillings of some kind. Cod roe for the Japanese market is actually one industry that has existed for many years in my tiny coastal community here in Nova Scotia, though overfishing etc. has decreased the quantity, and the Japanese economy has not been booming, either. Today, onigiri are highly popular in Japan as a snack food. A wide variety of flavors and fillings are employed. Onigiri are widely sold at convenience stores all across Japan. 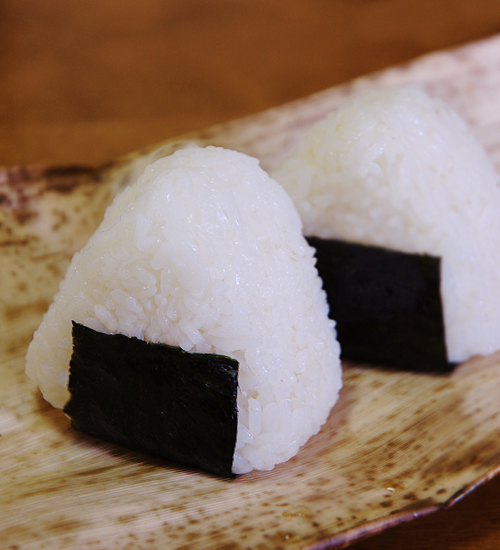 Note that the rice in onigiri is actually not vinegared, thus, it is not itself sushi. Nonetheless, onigiri are common, easy to make, and do not require any worrying about servings or other issues a chef might otherwise face, so you will find them in any sushi-ya (sushi restaurant) alongside quote unquote “sushi.” You can’t miss them. They’re everywhere. This entry was posted in Grammar, Japan, Tourism and tagged culture, food, Japan, nigiri, onigiri, restaurants, sushi. Bookmark the permalink. Hello, this is a genuinely fascinating Internet weblog and ive loved reading a number of with the content and posts contained upon the internet site, maintain the excellent function and hope to examine a great deal extra exciting articles or blog posts inside the time to arrive.